“People talk dry, but drink sweet.” The first time I heard that, I was interviewing the winemaker of Barefoot Wine, Jennifer Wall. It came up again during a twitter conversation yesterday, regarding a newspaper wine review saying a wine was dry, when it was technically off-dry. (Yes, splitting atoms for most wine drinkers, I know…) It seems that while we would like to think we like dry wine, in reality, many of us prefer a little sweetness in the glass. And that’s why this Robert Weil 2010 Riesling Tradition is a perfect quick sip for today’s article. Founded in 1875, the Weingut Robert Weil estate is located in the village of Kiedrich. 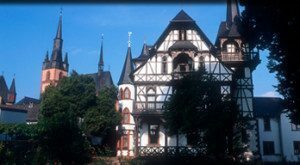 Even at over 130 years old, it is considered one of the Rheingau’s younger wine estates. The village of Kiedrich itself has been traced back as far as the year 950. The estate is still in the Weil family, and the founder’s great-Grandson, Wilhelm Weil, is currently continuing the family tradition of making excellent German wine. The Robert Weil estate cultivates about 222 acres (90 hectares) of vineyards, which are 100% Riesling. Weingut Robert Weil was part of Wine & Spirits Top 100 Wineries of the year 2012 and 2013. If you’re wondering what Weingut means, it’s definition is winemaker and indicates that the wine was grown, made, and bottled on the premises. It’s similar to the French use of Chateau. This wine was a sample sent to me by the team at Loosen Bros USA back in 2011. I was curious how it would taste with two years of age on it. Well made Riesling can last quite some time if stored properly. As a matter of fact, a friend of mine visited the Dr Loosen estate in Germany in 2012, and said that Ernie Loosen pulled out a bottle from 1973, and it was fantastic. In the glass, the color of the wine was a clear, day bright pale hay. The Robert Weil Riesling Tradition had an aroma of dried apricot and dried apples, and it really wasn’t a very expressive nose. With a medium to full body, flavors of crisp nectarine and white peach filled the palate, with a little honey, and hints of white jasmine appear on the finish. The wine is quite balanced, it finishes crisp and clean, and even has some nice acidity. Back to what I said earlier about drinking sweet even though we like to talk dry, the website speaks to that. “Produced exclusively for the U.S. market, the “Tradition” series offers the traditional range of Rieslings with sweetness, balanced by a crisp mineral structure. The Tradition QbA has a delicious array of fruits and is a pure pleasure to drink.” The Robert Weil 2010 Riesling Tradition has only 10% ABV (Alcohol by Volume), and residual sugar of 29.1 grams/liter. 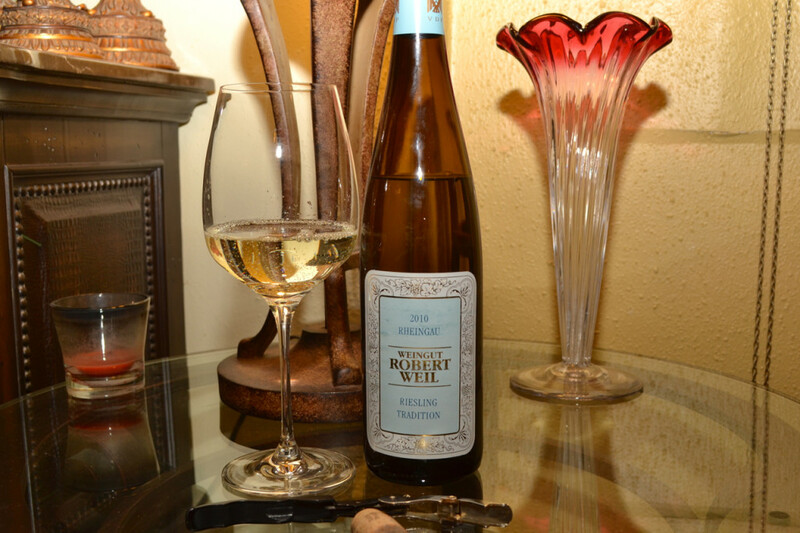 At $25, I think the Weingut Robert Weil 2010 Riesling Tradition is a very good wine. If you’re a fan of sweet fresh fruit, you’ll love it. However, even if you talk dry AND drink dry, I think this is a Riesling worth trying. What are your thoughts on German Riesling? Do you talk dry, but drink sweet? Let me know by leaving a comment below!